This post is part of The Month of Animated Features. Read part one of Disney’s Golden Age historical overview here. Following the 1942 release Bambi, the next several years were not a kind decade to Walt Disney’s animation studio. With a limited staff and limited funds, they produced only six “package films,” only one of which — the 1949 Adventures of Ichabod and Mr. Toad — showed any real promise. With the studio on the verge of bankruptcy, they needed a surefire success or risked going out of business for good. So Disney turned to what had worked for him best in the past: A classic fairy tale with a beautiful princess. 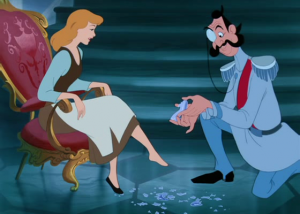 He hoped his new project, Cinderella, would strike gold the way Snow White had in 1937. 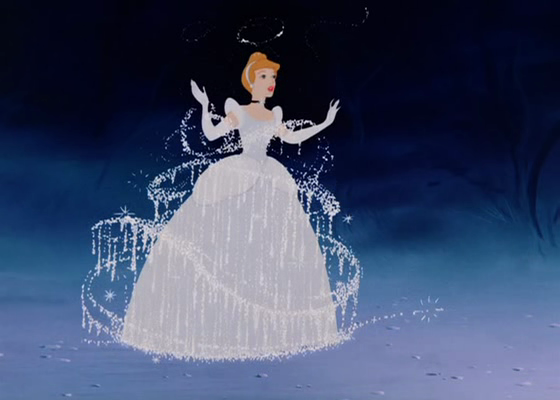 Cinderella used the largest budget of any animated film to that point — more than $3 million. It was an everything-or-nothing gamble for Disney, who had learned the hard way that pricey full-feature films weren’t a guaranteed source of income. He encouraged his animators to use some shortcuts to scrimp. For example, almost every scene involving human characters was filmed first with sample actors in cheap live action. Animators used this live film as a reference, which saved them significant amounts of time in the planning and drafting phases, with the side effect of detracting somewhat from the staff’s creative freedom following that filming. The one significant part of the movie not filmed beforehand were the scenes involving the animals, including the cat Lucifer, the friendly mice, and the assorted dogs and mice. As a result, the film ended with something of a clash between the naturalistic humans and zany animals. Nonetheless, the film was a smash and an resoundingly satisfying movie, emotional and exciting. The writers really put Cinderella through the wringer, giving her aunt and stepsisters truly evil personalities. The movie also has a real sense of magic and romance, particularly in the first dance between Cinderella and the prince. Disney wisely decided to retain full rights and responsibilities for the soundtrack, using his new record label to print the soundtrack. The self-produced soundtrack album made a tremendous profit for the company, as did the film in the box office. Aesthetically, the film works but does not sparkle with Disney’s best, in part because the character animations are occasionally bland as a result of the live action-to-animation process. Still, it’s a great fairy tale (more compelling and classic than Snow White) and a memorable movie particularly highlighted by the lively animals. While Walt Disney hoped Cinderella would be a beginning of his second reign as a beloved, influential animator, it would sadly be the last film whose final product bore large amounts of Walt’s own fingerprints. The studio’s next several projects featured intermittent work from Disney himself, but the man had become increasingly frustrated with animation. His later efforts were focused on live-action film and TV, and particularly on his new passion project, Disneyland. 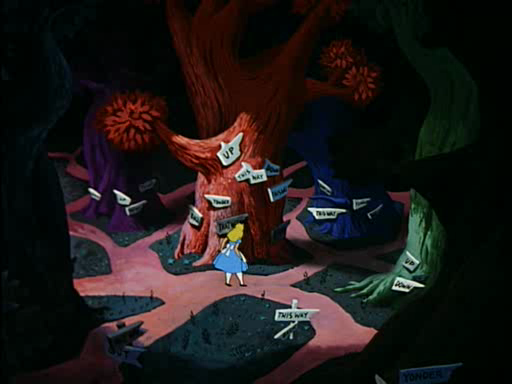 Next on the animation studio’s slate was Alice in Wonderland, released in 1951. The film had an extremely rocky production and was long in the works, to the point that Disney himself pretty much abandoned the product. His decisions to deviate from the Lewis Carroll’s source material, to make the film all-animated instead of featuring live-action characters, and use frequent, short songs were all maintained. The film is something of a mess, but an enjoyable one. It focuses on the whimsical verses of Carroll’s books. The voicework and animation are uniformly strong, but the plot is too episodic and surreal to be fully satisfying — even with the changes that brought the story back down to earth slightly. Perhaps because of its colorful vibrancy, Alice received some surprising love from critics (purportedly, Walt expected backlash from fans of Carroll’s work), but failed to catch fire in the States. It’s one of the few films from the decade to not become a massive hit. Disney the company has strongly supported the film in spite of its early disappointment. Alice was one of their first films released to home video, and it has featured prominently in parades and attractions at Disney theme parks. 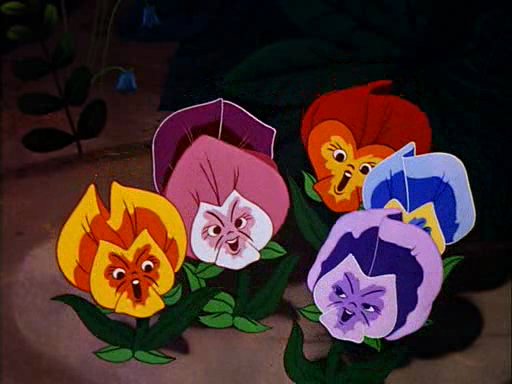 Much like Fantasia, the company also eventually banked on the film’s popularity with drug-users during the psychedelic era. The film’s 1974 re-release, promoted with trippy posters, was such a massive success that the company only waited seven years to release it again. While 1951’s Alice was only a middling success, 1953’s Peter Pan was a rousing one commercially. 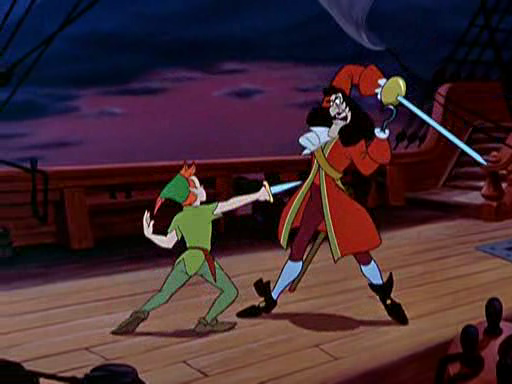 The highest grossing film of 1953, Pan also ranked among the more inspired animated features of the decade. The animation, overseen in part by Disney and in part by many of his most experienced animators, was vivid and imaginitive. 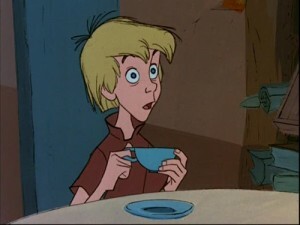 Plus, the film featured much more of a coherent story than Alice. Some of the philosophical quandaries of J.M. Barrie’s imaginative world allowed Peter Pan to resonate deeply with many viewers in ways that even 1950’s blockbuster Cinderella hadn’t. Unfortunately, a subplot of the film is extremely racist by today’s standards. The group’s encounter with the “Injuns” and ponderings of the “Red Man” are simply painful to watch, something that has tarnishes the enjoyability of an otherwise lovable tale with one of Disney’s great villains: Captain Hook. As was the case of the other 1950’s Disney films, the production of Peter Pan was a long, drawn-out ordeal. Disney secured the rights to the film early, then the film sat in purgatory during World War 2, before finally being dragged out of the vaults and completed. 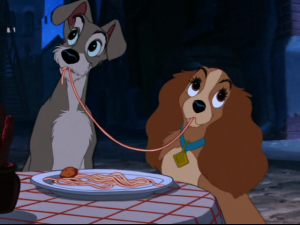 But Disney’s next film, Lady and the Tramp, had an even longer and more perilous development. Some reports have early work on the film beginning as early as 1937, the year Snow White came out. Yet Lady and the Tramp kept being shelved by the studio until the early ’50s, finally receiving a release in 1955. Writers and fans remain divided on whether Lady and the Tramp deserves the title of “classic,” but surely its title romance is one of the strongest and most compelling among the studio’s works. 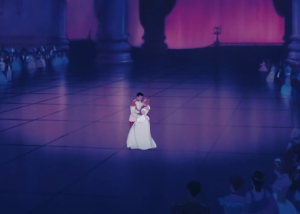 The film has typically strong animation and a warmth to it (including the famed spaghetti scene) that evaded Peter Pan, Alice in Wonderland, and to a certain extent, even Cinderella. The film resonated strongly with audiences, surpassing the box office of every Disney animated feature except Snow White. 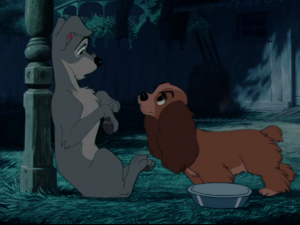 Walt Disney’s role in Lady in the Tramp was again much smaller than in the earlier films, and the studio would produce only three and a half more features under his tutelage: 1959’s Sleeping Beauty, 1961’s 101 Dalmations, 1963’s Sword in the Stone, and the early stages of 1967’s Jungle Book. 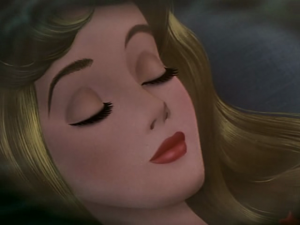 Sleeping Beauty was conceived, like Cinderella, as something of an heir to Snow White, but Disney’s increasingly short attention span with animated features caused the film’s creative vision to be dispersed primarily to the visual design department, a change that shows. 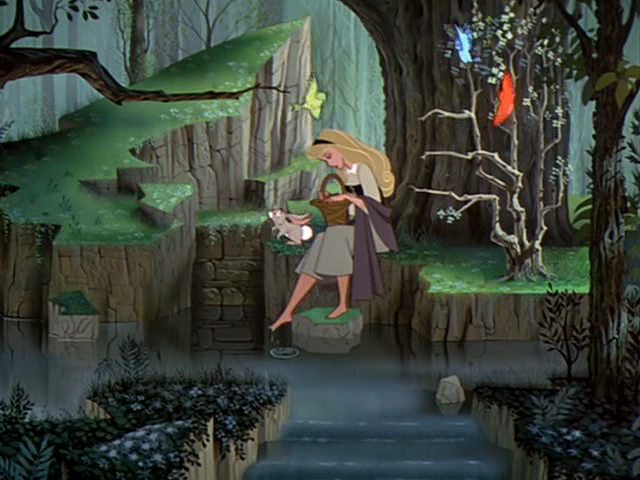 The scenery and character animation of Beauty are of the first order, with stunning detail and colors. But the story is the weakest of any of Disney’s full length features to that point. The film seems to get a free ride from Disney loyalists, perhaps for its purity and naivete (much like Snow White), but there’s no shying away from the lack of memorable characters, thematic undertone, or plot complexity. History has been kind to Sleeping Beauty, perhaps kinder than it should have been. Audiences at the time were not entirely enthused by the project, as the film only narrowly made a profit. The unexpectedly poor results forced the studio to make large-scale layoffs. But in time, Sleeping Beauty eventually earned its keep, with seven re-releases bringing cash to Disney’s coffers from 1970 to as recently as 2008. The penultimate film released in Walt’s lifetime was 101 Dalmations, a charming entry to the Disney canon. 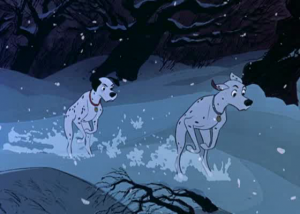 A newer, more efficient technique of transferring animation to film gave Dalmations a sharply defined look, with strong black lines outlining characters and pieces of the sets. Many animated Disney films have been as defined more by their villains than their heroes, and 101 Dalmations is one example. 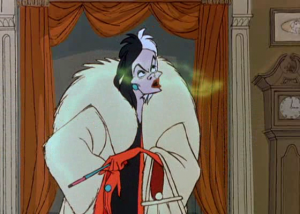 The wonderfully named and animated Cruella de Vil at times resembles a demoness more than a fashion-obsessed plutocrat. She also receives one of the most memorable Disney numbers of the decade, a catchy ditty that paints her as a menace. The film only debatably fits into the “Golden Era” of animation, as its new animation technique and style and its modern setting don’t particularly fit with any of Disney’s other works to that point. Still, 101 Dalmations retains a level of entertainment above any Disney animated film following it until at least 1977’s The Rescuers, if not 1988’s Roger Rabbit or 1989’s The Little Mermaid. It’s hard to completely discount Walt’s presence, as the studio would quickly reach a weary inconsistency following his death. 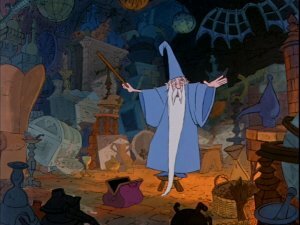 Last — and perhaps least — among full-length animated features in Disney’s lifetime was 1963’s The Sword in the Stone. The film was conceived and directed by animator Woolie Reitherman, who pitched the idea of adapting an Arthurian novel to Walt Disney in spite of reservations from his fellow animators. Disney OK’ed the idea — in part because he loved the Broadway show Camelot — and Reitherman put the vision to screen. The end result felt more like a jazzy, modern-toned re-interpretation than a timeless adaptation. Though the film has some good songs and a few dazzling scenes and visual devices, the plot is too episodic and the characterization too weak. Walt Disney’s death in 1966 seems a good moment to cap The Golden Age, as most film historians agree the period was cooling down by the late fifties and early sixties, both in the spheres of features and shorts. Though Disney’s role was greatly diminished in the above-average 1950’s films compared to the masterpieces of the late 1930’s and early war years, his presence and artistic sensibilities still reigned and even carried over to 1967’s Jungle Book, the last film that Walt had any direct input on. Regardless of where you draw the closing line for Disney’s Golden Age, it’s clear in his quarter century of animated work,he produced a large slate of classics and even a few masterpieces worthy of repeated reviewings. His influence is still detectable in animation in countless ways, not the least of which is simply the ambition and amount of love poured into animated features the way he did from the format’s birth. To this day, animators and writers turn for inspiration to the likes of Pinocchio and Bambi, because attentive visual design and storytelling never die. ← Snow White and the Seven Dwarfs (1937): The greatest or the outdated-est? so i’m curious, what was going on in animation outside of disney at this point? anything? 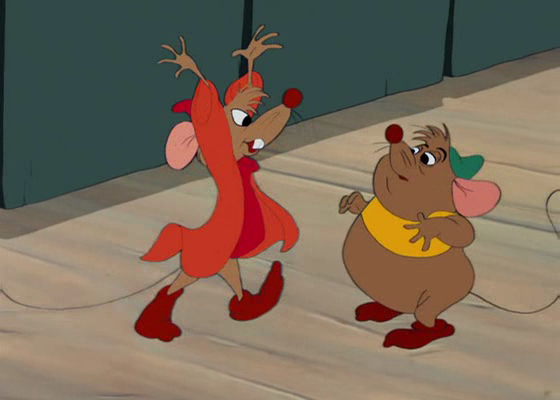 it almost seems silly that cinderella filmed real people before animating them haha. also, was selling the soundtrack to a movie a new thing? i agree about the weakness of sleeping beauty, i’ve only seen it once and it was very thin. I appreciated your well-written history and analysis. However, you forgot to include Sword in the Stone (1963). 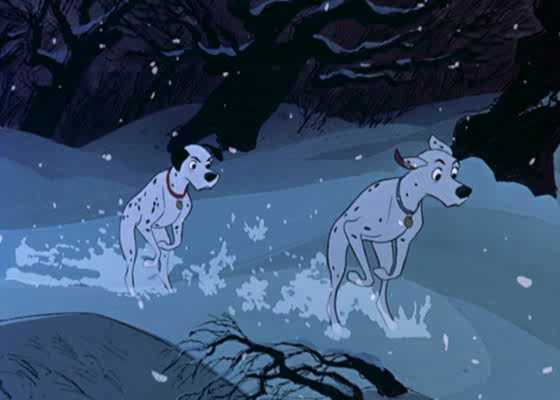 It was released two years after 101 Dalmatians. It was not a particularly strong film and it is therefore probably not worthy of Golden Age status. Nevertheless it should be given a brief mention in order to correct an inaccuracy in your article. It was this film, not 101 Dalmatians, which was the last to be released in Walt’s lifetime. You couldn’t be more right, Mike. I mentioned this in a later article after I realized my omission. Thanks for the heads up, and thanks for the kind words. I’ll make a revision at some point. Mike, I added a brief section. Thanks again for the heads up.